The Reid brothers, Brendan and Dan, were recently featured in the Seattle Times. I've seen the WA Brah print around on t-shirts and stickers. 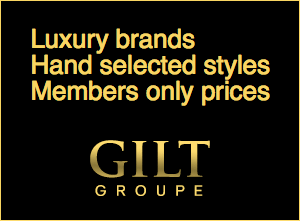 Never knew the full story on this brand, but their base of operations is in West Seattle. They seem to be doing pretty well for themselves too. It shows that with an idea, something can come to fruition. Click here for the full article. 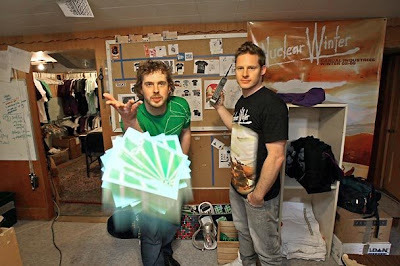 They came up with the idea for Casual in the late 1990s while snowboarding on Mount Baker. They thought all the hooded sweat shirts looked the same, so they designed their own. A few weeks later, Mt. Baker Snowboard Shop in Glacier, Whatcom County, agreed to sell them. Eventually, they added T-shirts and stickers. 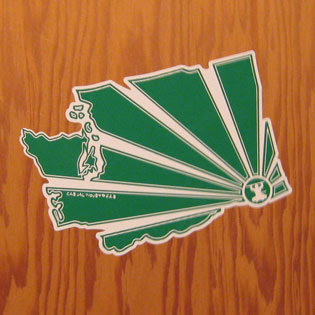 One of their most popular designs, called WA Brah, shows the state as it appears on a map, spliced with sun rays and a small ninja figure where Walla Walla is (insert your own meaning). Another features the Seattle skyline and an evergreen tree. "You would run into people here wearing 'I love NYC' or San Francisco shirts, and it always seemed odd to me," said Dan, 30. "If you live here, you might as well claim to represent it and be proud of where you're from — or move."